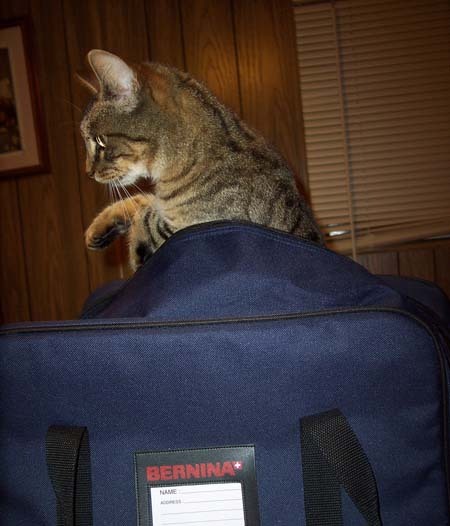 I won my BERNINA aurora 440QE in the “8 Weeks and 30 Ways to Win Sweepstakes” a few years ago. I absolutely love the BERNINA Stitch Regulator it came with. I’d learned freemotion from taking a few classes at the dealership and thought I wouldn’t need the BSR (though I was intrigued by the advertisements, I couldn’t afford it at the time, nor did I have a BERNINA.) BUT — it has made me happy because it is so much easier on all the muscles of my back, neck, shoulders, and arms! No one testifies this about the BSR, but it makes my free-motion sewing so much less stressful — and I’ve cut my freemotion-stitching time by 2/3! When I won this machine I wanted to tell someone to give the owner of BERNINA a great big hug from me! He is a real answer to prayer, and made a long-time desire of my heart come true. I’m not a pro, I just enjoy myself. This small wall quilt is from Quiltmaker Magazine, from an article written by Silver Lining Originals. 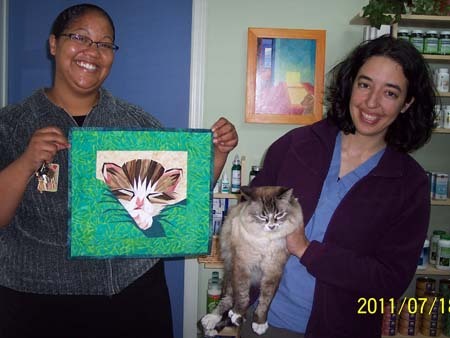 (They will take a photo of your pet and create a paper-pieced pattern of it.) I tried to revamp some of the colors from their kitten to my kitty, named Kairi. Kairi has a small bit of white on her chin, so if I do this again the cat will have less white, more tans around the nose/whiskers. Kairi is my sweet little girl. I didn’t keep this piece — I gave it to a veterinarian who just opened an office here as an Open House gift. 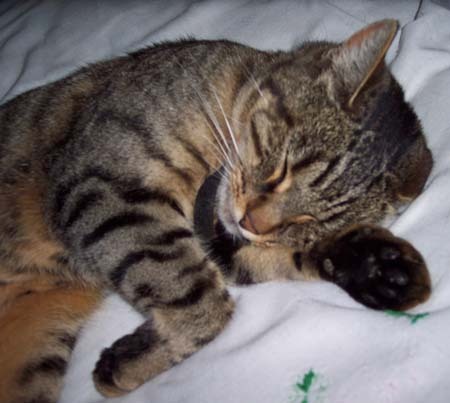 When I was making it, and they were building the new veterinarian building, I thought “This is just what their work is all about.” The cat in the photo is Phoebe, a disabled cat who lives at the office — Healing Spirit Animal Wellness Center in Eureka, CA. Kairi loves my aurora, too! Am waiting for my Bernina 550 QE to arrrive. It’s on back order right now. Can’t wait to try the BSR and improve my free motion quilting. 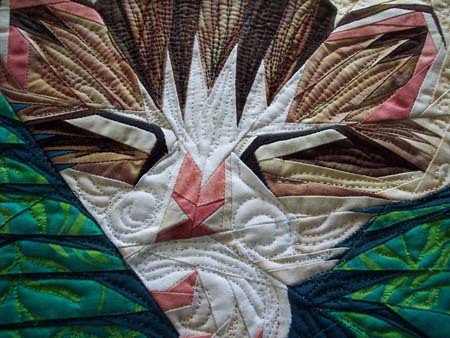 Have got several quilts waiting to be quilted and also a few thread painting projects just waiting for the new machine. This will be my fourth Bernina machine! You did a wonderful job making this wallhanging! I have this pattern and the matching one of a dog that I am looking forward to making for my son and daughter-in-law. I’m glad to see yours – it is motivating me to make mine!